Get It Scrapped ~ Contrast in Title (Value) ~ Seriously Mom? Hello friends! I have a fun new layout for you today that I made for Get It Scrapped. Make sure to visit the blog post over there to find all the other layouts made by the design team. Ok, let’s jump right into the layout here! I am just so in love with this story behind the photos and I knew I wanted the layout to be able to reflect that. 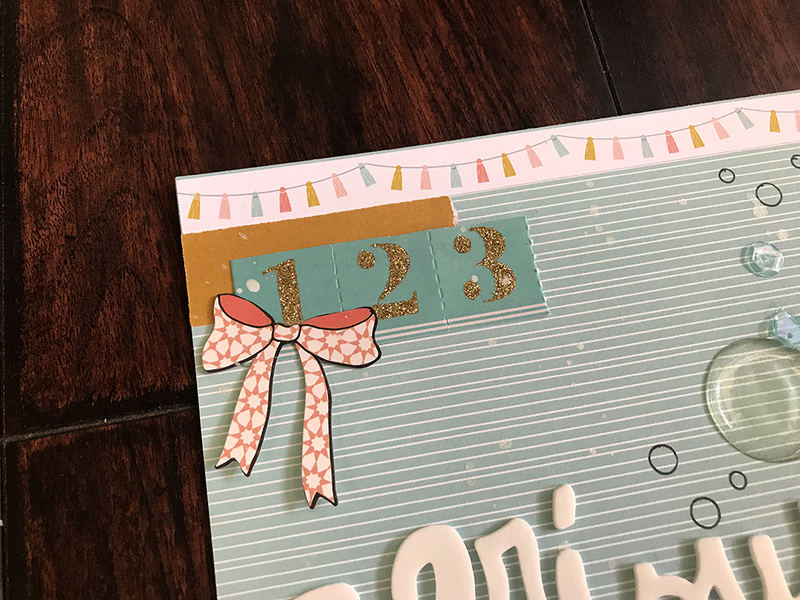 I started with the soft blue paper and expounded the story by adding simple bits and pieces to the layout. My starting place is usually the photos and then I went to my title from there. I had an idea of what I wanted it to be, something about how awkward this first bath at home was. I got this ‘seriously’ phrase in a recent Secret Not Secret kit and after trying out a different wording I decided to go with this because it worked so much better. 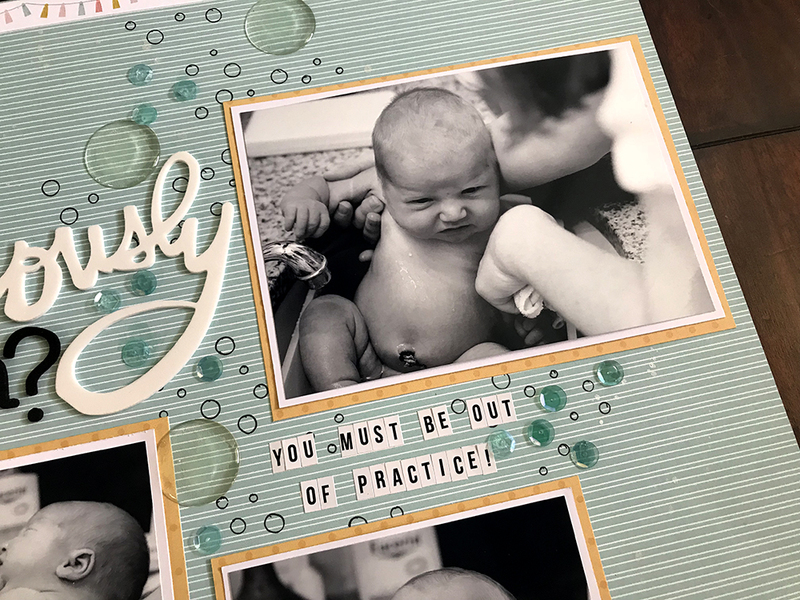 The story is about how out of practice I was with giving a bath to a new baby. It was perfect that the title comes from the interpretation of my son in these photos. He does NOT look comfortable at all. I added a sub title to help the reader understand why Tinian is upset and uncomfortable. I wanted the layout to be simple so I pulled out a circle stencil and traced using a black marker. 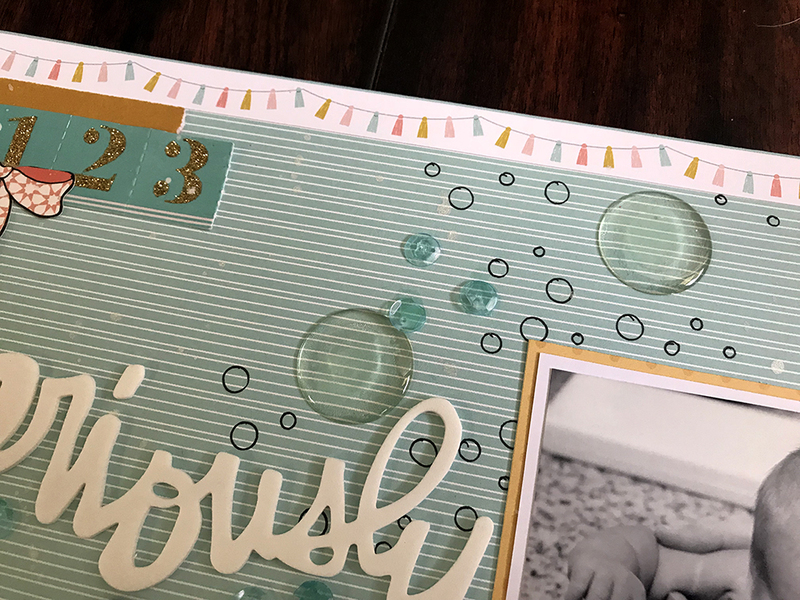 I also added the epoxy bubbles and sequins to create more of that bath time feel. I needed a cluster in the top right hand corner to create a little more balance. 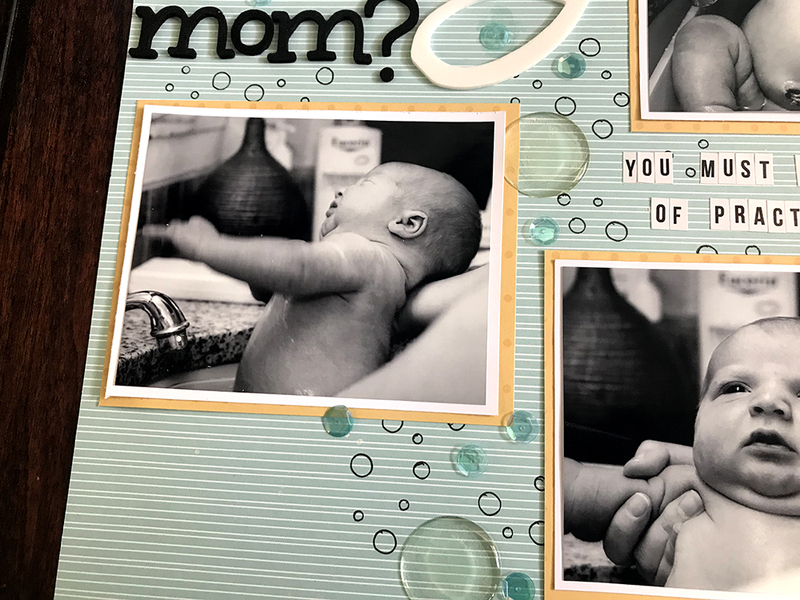 With all the bubbles, photos and text, the bottom and middle half of the layout felt heavy. 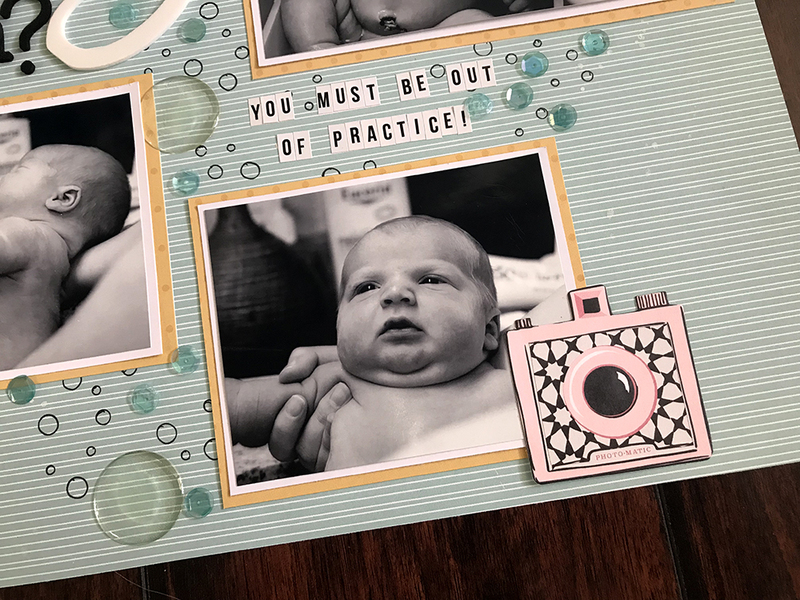 I added the border strip at the top and created a little cluster of ephemera in the left hand corner. It helps bring your eye down the page. Now, this assignment put emphasis on the value of title contrast. When I say value I am meaning light and dark. I went very literal with this context and my title is white and black. Having the two contrasting colors makes the title pop off the page and brings your eye and understanding of the layout right where it should start. The title tells you that my son is frustrated. 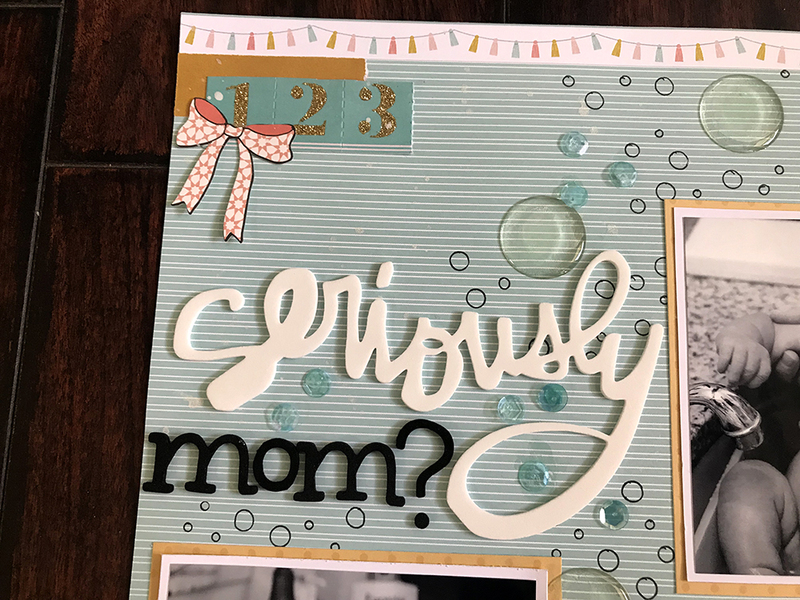 I picked a smaller black font for the word mom because in a sense, Tinian is yelling at me and the loudest word would really be seriously, and mom would be secondary. Having the photos under the title helps bring attention to the sentence. I added this cute little camera to create a frame and a resting place on this last photo. I will eventually write out my journaling down here in this bottom right hand corner. Thanks so much for stopping by today! Make sure to head on over to the get it scrapped blog to see the other layouts using different methods to create contrast in titles.